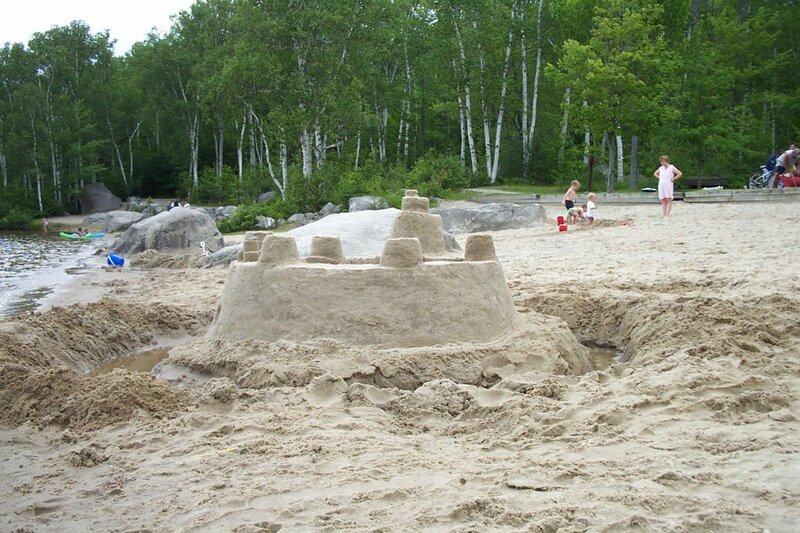 This castle I built at Sand Beach in Acadia National Park, on our honeymoon (2009). I made it up as I went along, as usual; I thought it ended up with a bit of a nautical feel, hence the name. I also built a farmhouse, but I couldn’t get the silo to work. 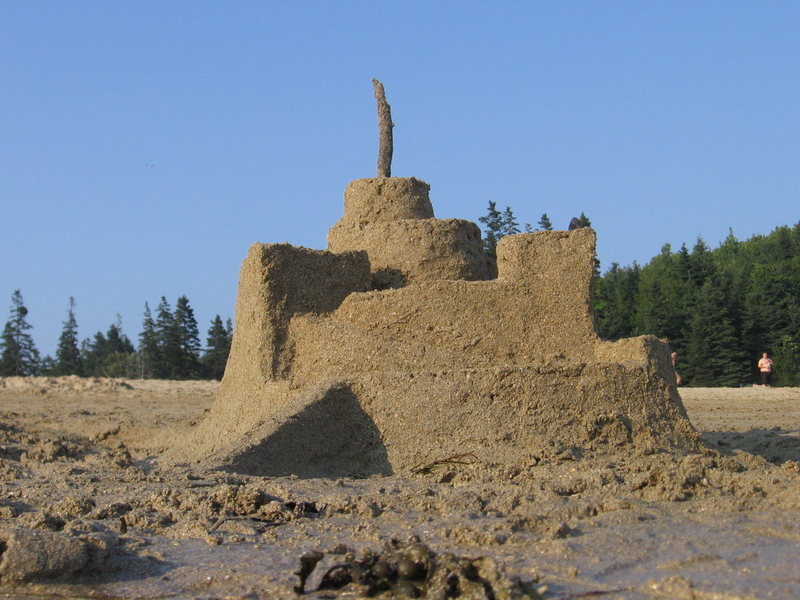 Once again my brother strives for accuracy in construcion at Papoose Pond (2005?). It’s a concentric castle with inner and outer baily, loosely based off of some of the welsh castles of one of the King Edwards. Or something like that. Threeish feet bigish, and tallish like six inches. 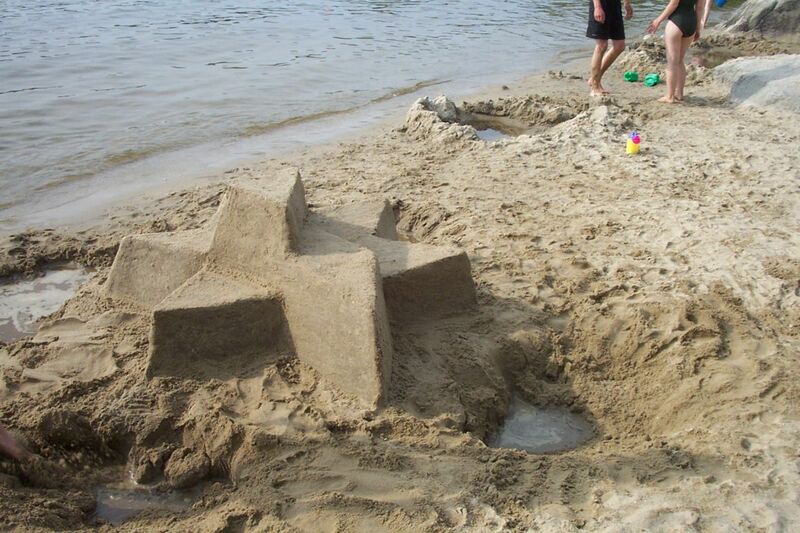 The first and only creation yielded by our summer vacation of 2005, we were only on the beach one day. The somewhat odd name comes from the fact that no one had any brilliant ideas as to what to build, so we all started building something and connected it all. 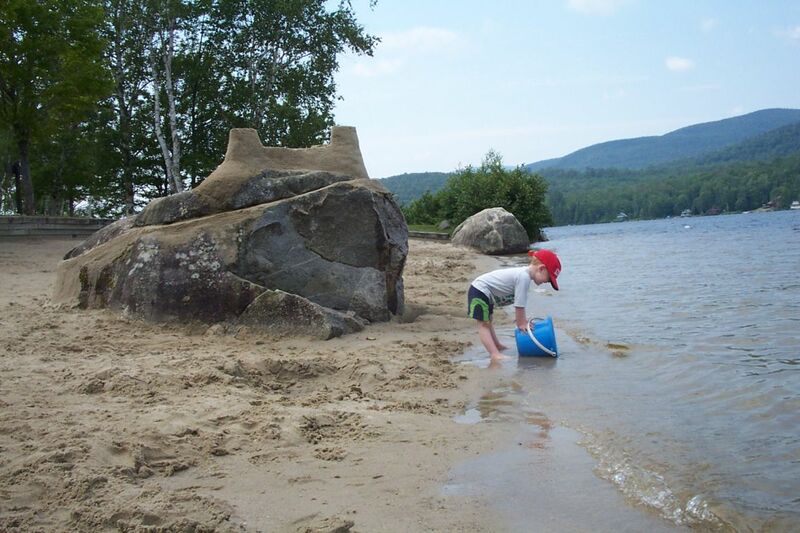 The sand on Sand Beach (Acadia National Park, Maine) is decent, if slightly peculiar – a lot of it is ground up shell. It’s coarser and drains more quickly than some sand, but holds together OK if you’re patient. Repairs are a bit tricky. …or something. This one was built atPapoose Pond Resort in Waterford Maine. On the smallish side of things, but plenty of character, nonetheless. The pictures are courtesy of my friend Jeff (due to a slight mishap with our digital camera), so I won’t lament the lighting conditions here. 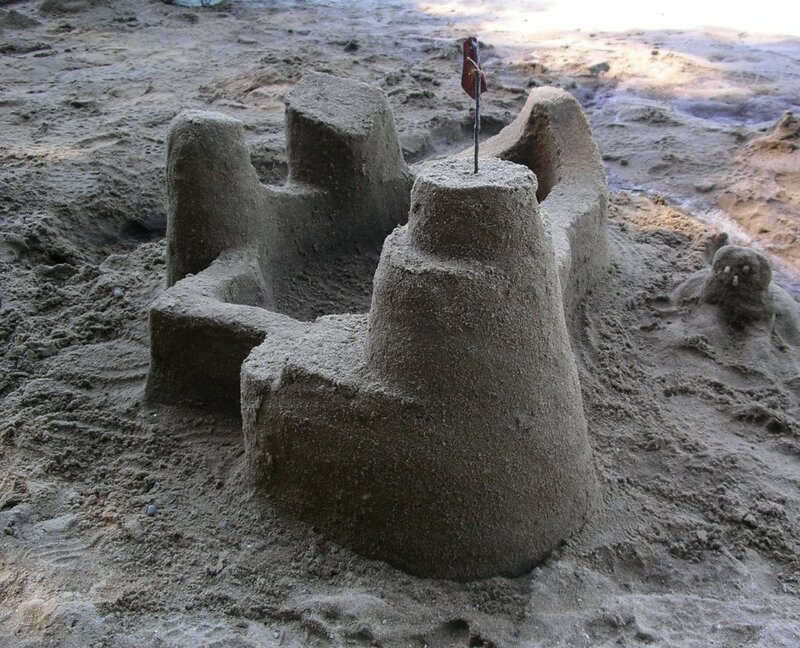 The sand isn’t tops, either, but workable. This castle really ought to have a gallery to get it’s different angles (of which there are plenty) properly. 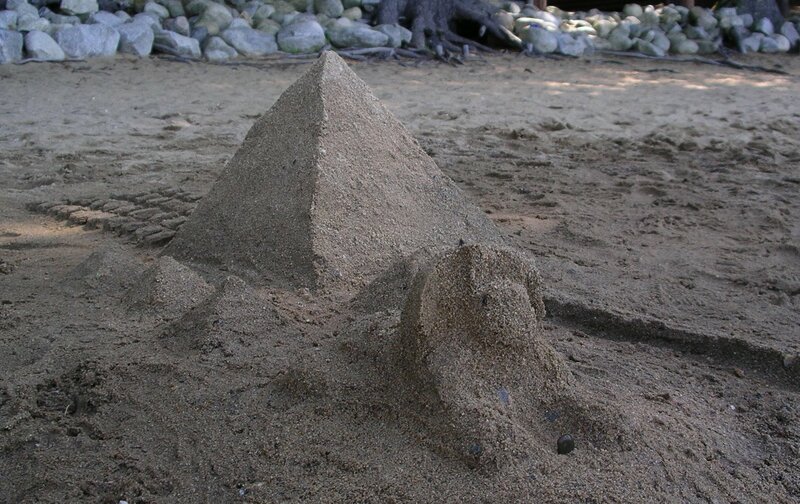 My brother Josh takes full credit for this piece of work, which is, as far as sand pyramids go, pretty historically accurate. 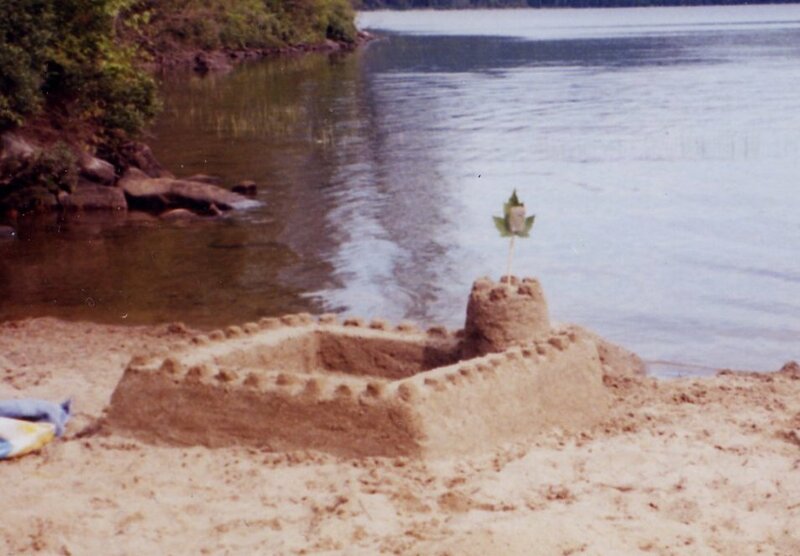 It was also built at Papoose Pond, we were there after school had started and the rest of my family was doing a segment on Egyptian history, hence the subject and detail. Actually, Josh is always detailed about things, but more so when he’s just been studying it and knows even more details than usual. This one really needs a gallery to appreciate it fully, as well, and the graininess is mostly the sand, not the photo. Really. MapleGoose Castle, the stronghold of something. It is chiefly notable because it is crenelated, unlike most of the other stuff we’ve done. It also has some little buildings inside along the wall, but you can’t see them. We also created a ridiculous amount of meaning in the flag – see, it’s a down feather from a Canada Goose, stuck in a maple leaf (Get it? Canada?) and the Striped Maple tree (a leaf of which we stole) is also known as a Goose Foot Maple. Um, and we’ll stop talking now, after we tell you it’s a couple feet square and we built it at some pond near Rumney, NH, but I can’t remember the town it’s actually in. 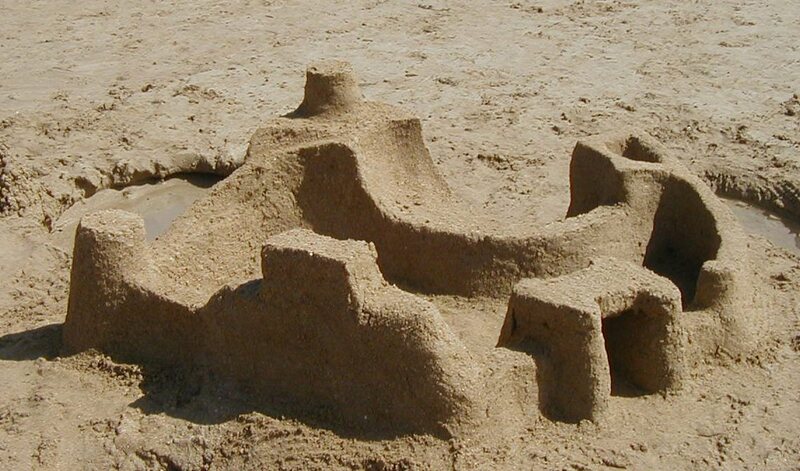 That wonderful creation, sand – which, when wet, will hold a shape; when dry, still won’t come out of your shoes. 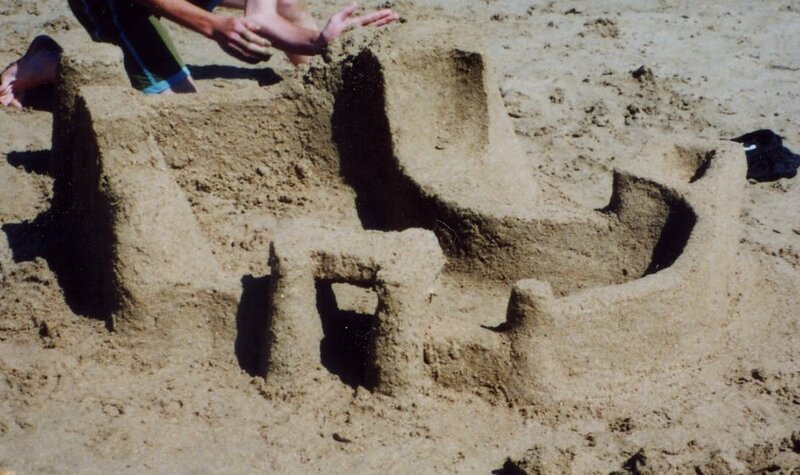 We (I, siblings, friends) really only started building castles while on vacation in 2004. I’m not really sure if we qualify as “serious” builders or not. ﻿This first batch was built (in what, 2003? 4?) while camping at Stillwater Campground in Groton State Park on Lake Groton in Vermont. 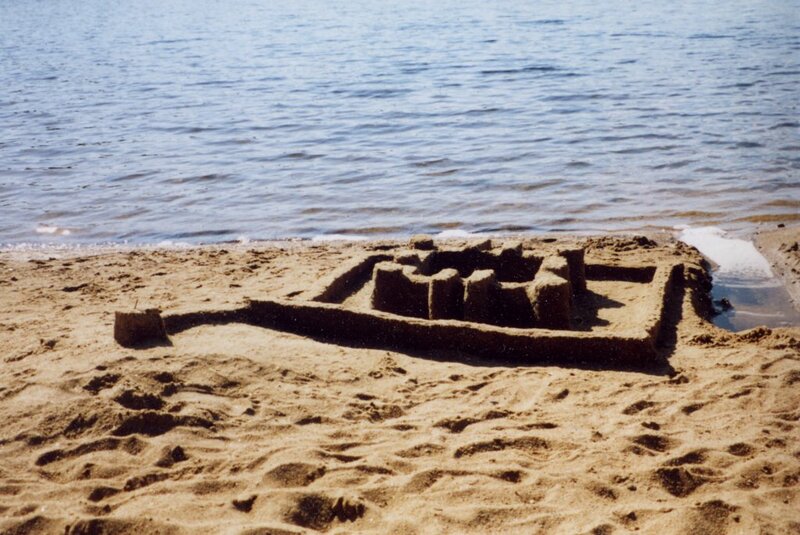 They were all constructed at Boulder Beach, a handy paddle (or sail, if wind) across the lake from Stillwater. ﻿﻿The Castle of Beginning was the first one, hence the boring name. It’s still not bad, though I don’t have a shot of it finished. Had some technical difficulties which required reconstruction of the tower three times. Mostly built by yours truly, before I enlisted the whole crew. Roughly two and a half feet in diameter. ﻿Clerm (pronounced Clairm) was not technically the second, but we didn’t take any pictures of the second one because we didn’t get very far on it. (Practice, if you will.) Who cares about piddly numerical order, anyway? Clerm was a good castle. About four feet in diameter. The Castle Polygon! We decided to be different and go for something more artsy than your usual castle type. Or that’s how it ended up. It started as something different, maybe like Fort Ticonderoga, but that’s as far as the fort thing went. 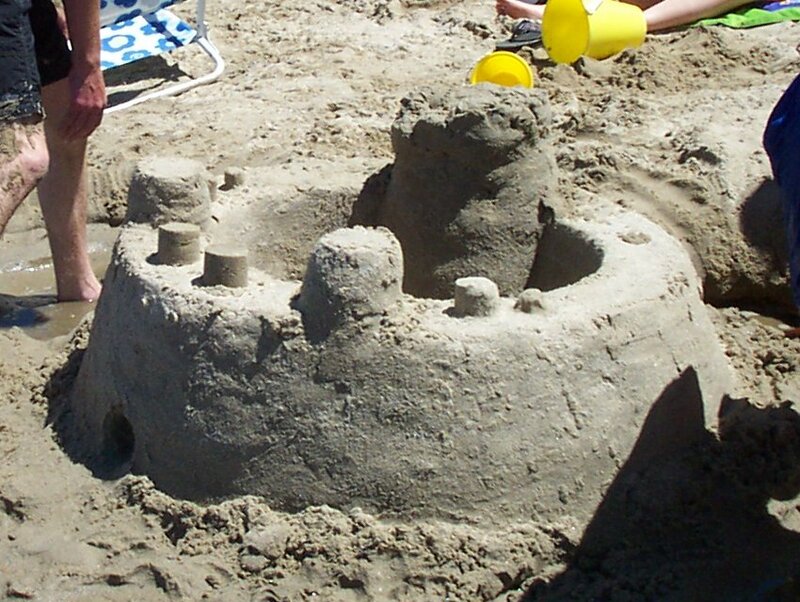 Our castles tend to grow somewhat organically. About two feet high, probably four to five feet in diameter. Fortress Whasit – The fortress that hath not a name. It’s really amazing how hard it is to build on top of a rock. Dry sand won’t stick and sand that’s too wet drains quickly and washes out foundations, so one must regulate the water content very carefully. Even so, we still had to heap some extra dry sand around the base in places to keep the bottom of the wall from washing away. This shot doesn’t give you the best idea of the castle itself, but it shows the road down the rock and the kid lends a nice artistic touch. This one is about three to four feet off the ground.